As any kid who ever read Spider-Man comic books (or watched the movies) can tell you, with great power comes great responsibility. It's a lesson that James Bond (Marcus Dean Fuller) has to learn the hard way in ONE FALL. Despite his heroic sounding name, James appears to be anything but when we first meet him in his prison cell (we don't learn his crime until later in the film, so I won't reveal it here). One of the first things we notice about James at this point is that he has the power to heal. When James cuts himself, he touches the wound and it instantly closes up. After being released, James heads back to his hometown of One Fall. James hasn't talked to any of his friends and family there in some time, so he has a few surprises waiting for him: his father Cliff (Mark La Mura) is in the hospital recovering from a stroke, and his former girlfriend Julie (Zoe McLellan) is now dating his more successful brother Werber (James McCaffery), a doctor. James already seems to be a bitter and self centered guy, and this news doesn't exactly improve his disposition. Despite seemingly having the power to make his father better, James does nothing to help the man. Instead he guilts his brother into getting him a job at the hospital as a janitor and then uses that position to sell his healing power to some of the patients. James also moves back in to the family home where he meets his odd comic book-obsessed neighbor Tab (Seamus Mulcahy). The boy figures out that Marcus has powers and tries to convince him to use them for good, but can James get past his emotional baggage and change? A lot of what gets released as independent films these days are actually produced by some major studio's indie division in hopes of picking up an Oscar nomination. As for the sort of independent films that screen at big festivals like Sundance, it's gotten to the point where many of them seem just as calculated and aimed at a particular market as any other kind of genre film. You rarely see a truly personal and idiosyncratic low budget independent drama like this getting a theatrical release. It's just a simple, straightforward story that meant something to the people making the film, and they made it without really tailoring it for any particular market. For that alone ONE FALL deserves some respect. Just because a movie is worthy of respect doesn't necessarily make it worth watching, though. Fortunately, ONE FALL is a solidly made film with a compelling and entertaining story to tell. The actors may not be huge names, but these are definite professionals with a good bit of television work and a few smaller films under their belts. As you might expect from an actor directing his first film, this is a character driven piece that gives the actors room to breathe and flesh out their roles. However, Fuller displays a strong visual sense as well, with recurring motifs like Julie skinny dipping in a lake accentuating the film's mood and themes.. I was worried that ONE FALL would wind up being one of those schmaltzy “inspirational” films that pounds the viewer over the head with some kind of spiritual message. There's definitely a message here, but it's handled with a refreshing subtlety and without any explicit explanation for how or why James got his powers. Fuller's performance in the lead role also deserves a mention, as it isn't easy playing a character as initially unlikable as James and then winning back the audience by movie's end. ONE FALL is by no means a perfect film. At times it gets a little too quirky for its own good, and I found the character of Tab to be grating and overly affected. Tab's enthusiasm and naivete might have worked better for me if the actor playing him had been a bit younger, but with someone Mulcahy's age in the role, it needed to be toned down a bit. 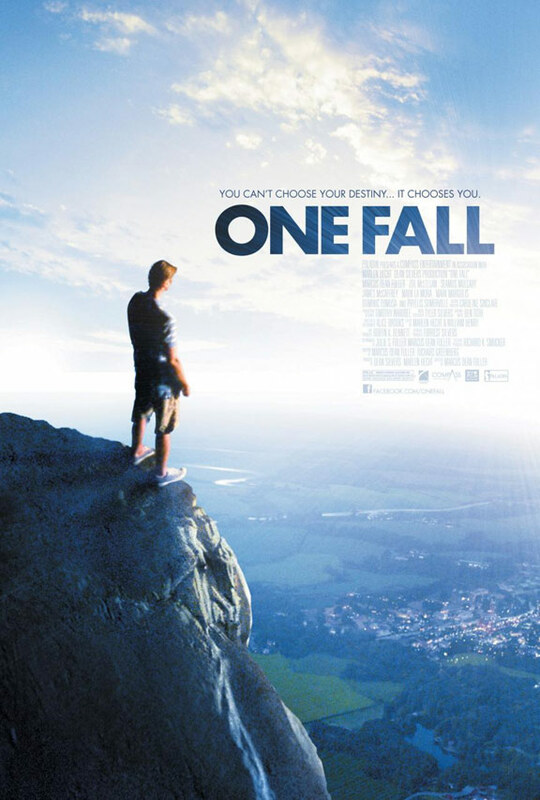 All in all, though, for a movie by a first time director working with a shoestring budget, ONE FALL is way better than it has any right to be. It's not “pretty good for a low budget film”; it's just plain good. 3 out of 4 stars.